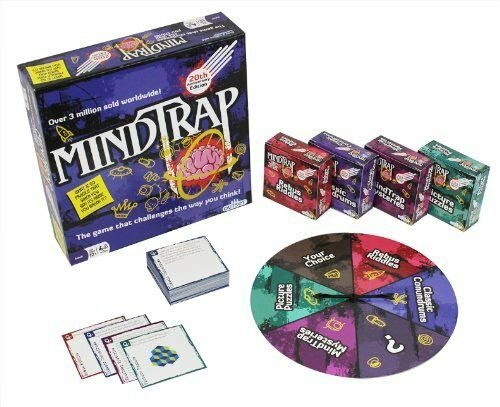 Kids can challenge themselves with this newer, updated version of the classic Mind Trap Brain Teaser board game. School age children can challenge themselves and their brains with four different types of questions-riddles, conundrums, mysteries, and puzzles in this updated version of the classic Mind Trap brain teaser game from twenty years ago. Children can test their knowledge with this collection of four different categories- riddles, conundrums, mysteries, and picture puzzles. An updated version of the classic Mind Trap game made twenty years ago. The game comes with a spinner, and 96 cards of each category- Classic Conundrums, Rebus Riddles, Picture Puzzles, and Mind Trap Mysteries. Each player will spin and whatever category they land on is the one they have to pick a card from and answer. Everyone takes turn doing this throughout the game. 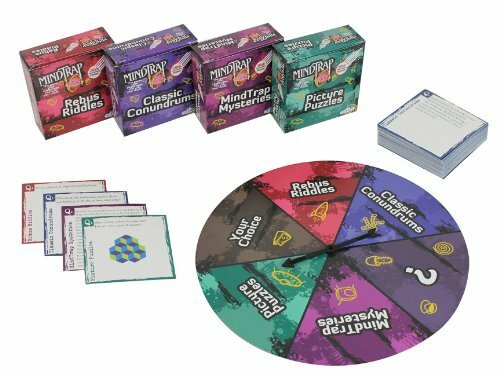 A new twist on the original Mind Trap game, the 20th anniversary addition includes updated versions of the same categories- riddles, conundrums, picture puzzles, and mysteries. Just like the older version, the game is challenging. It is less trivia type questions and more difficult questions that require a person’s logic and knowledge. With all the different types of questions it has, users have said it’s a good learning tool for school age children, because even though the questions are challenging, they are at the level where they can answer them. It encourages thinking in a fun way. However, some users have said that it’s too hard. However, the purpose of the game is for it to be challenging and make the players think. Because it’s hard, it takes a long time. This is not the type of game that can be played within ten to fifteen minutes. However, the questions make for a good brain game and are tough, but fun and interesting. Do not get pieces wet. If they do get wet, dry off immediately with a dish towel. The game comes with a spinner and playing cards. There are 96 cards of each category-riddles, conundrums, puzzles, and mysteries. The spinner is made of cardboard and the cards are similar to other classic playing cards made of a thick paper. The main concern users had with this game was that the questions were very hard to answer. However, it’s not an easy game, and is made for kids who want a challenge. It’s a challenging game, and takes a long time to play compared to some other board games.